This hostel’s advertising could not be more enticing. Set on the entire 10th floor of a modern apartment building two blocks from the Lake, the glass walls offer a stunning view of the snowcapped mountains reflecting in the vast lake that is most of Bariloche’s charm. 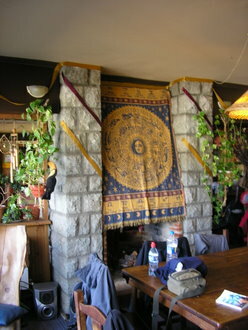 The common rooms are artistically decorated and look spacious. The kitchen is equally spacious. Unfortunately, looks are deceiving. Trying to make reservations at Hostel Penthouse 1004 is a prolonged effort in patience. 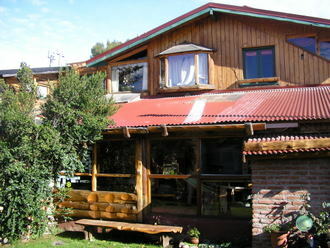 The hostel does not accept reservations unless you send payment in advance which in Argentina is difficult due to the unreliable privatized postal service - credit cards and personal checks are not accepted so it’s either mail cash, which is foolish, or wire money by Western Union, which charges at least a 10% fee. After going back-and-forth by e-mail, I finally just took the chance that a private room was available. I am glad I did not send money in advance since I left after two nights instead of staying the four that I planned. 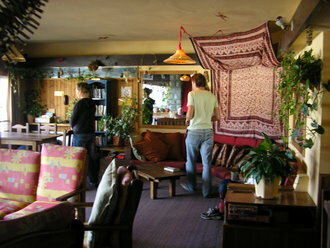 The common rooms and kitchen can be considered spacious if dozens of people were not crammed into them every evening. It is difficult to prepare a meal and then find space to sit and eat, even though the facilities are up-to-date for a hostel. With the talking from so many people, plus the music playing from the stereo, there is constant noise at a high level. The evening is not relaxing. I had friends staying in the dorm rooms - 6 bunks to a room - and they could not sleep on either of the two nights they stayed due to people coming in-and-out of the room at all hours - Bariloche is a party town. I had a private room that ended up not having a private bath - I shared a bath in the hall. The room was small, unattractive and the mattress thin and uncomfortable. 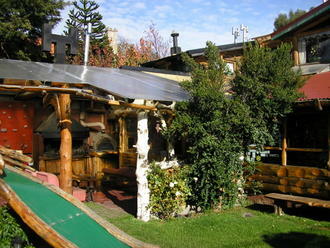 The hostel is located a half-dozen blocks from the Lake up the hill that Bariloche climbs. An enclosed garden courtyard separates the wood chalet-style building from the street. 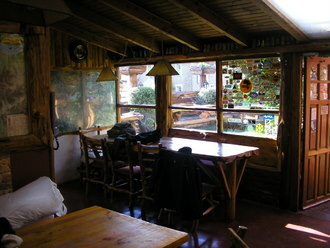 It is a quiet, non-party hostel that attracts an international mix of people seeking the outdoor adventures the surrounding countryside offers. It does provide wi-fi in the common areas as well as a TV and game room. The kitchen is perfectly adequate and has decent storage space. The hostel was quiet, and it was possible to meet and have conversations with other guests without the competition of ambient noise. Neither hostel are members of Hosteling International. It is easy to do a web search on Bariloche accommodations, and, unless you are going during the winter ski season (July and August) or the summer family vacation season (Christmas through Easter) reservations are not necessary due to the large number of B & B's, inns and hotels. It is best not to make a reservation that requires a deposit unless you have the cancellation policy in writing. This includes the policy governing early departure. If you pay with a credit card and wish to leave early, your card may be charged for the unused days. Know ahead of time! 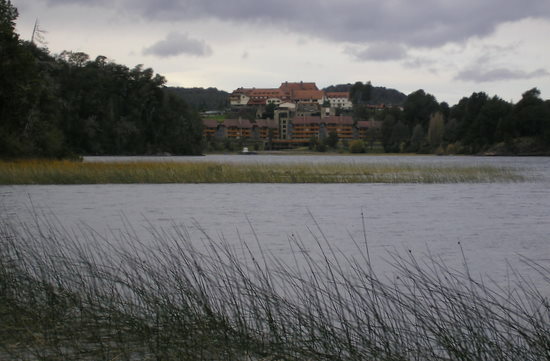 Next time I go to Bariloche, I'll treat myself and stay in the peace and quiet of Hotel Lloa Lloa.